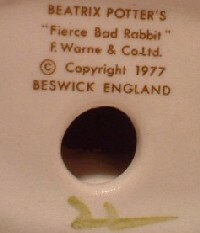 ITEM B82 - Beswick Beatrix Potter Fierce Bad Rabbit 1st Version (Feet Out) number 2586/1, BP-3b stamp. A Beswick Beatrix Potter figure Fierce Bad Rabbit 1st Version (Feet Out), number 2586/1. Modeller David Lyttleton, issued from 1977 to 1980. This figure has the BP-3b backstamp.